As a stay-at-home mom of a 20-month-old, it’s easy to have the walls of our home close in on us if we don’t make the effort to get out. So we’ve taken up hiking as a way to enjoy the beautiful outdoors, explore new places together, and get some exercise. 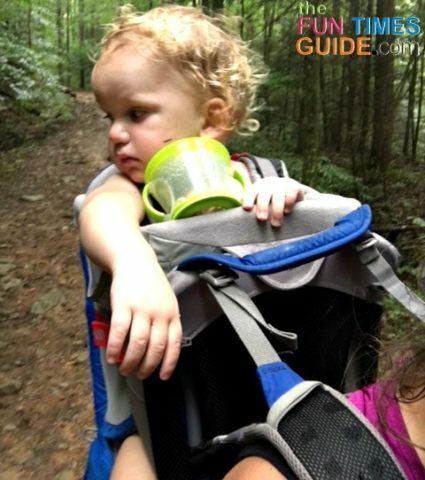 One thing that I’ve learned firsthand… hiking with a toddler requires a good hiking baby carrier! The fall is my favorite time of the year — because the temperatures are a little more bearable. Plus, the fall color display is so pretty and world renowned. The colors of the leaves reach their peak sometime between mid October until early November here. Besides the amazing Smoky Mountains in our backyard, the whole state of Tennessee has an infinite amount of trails, waterfalls, caves, and lakes to hike and explore. 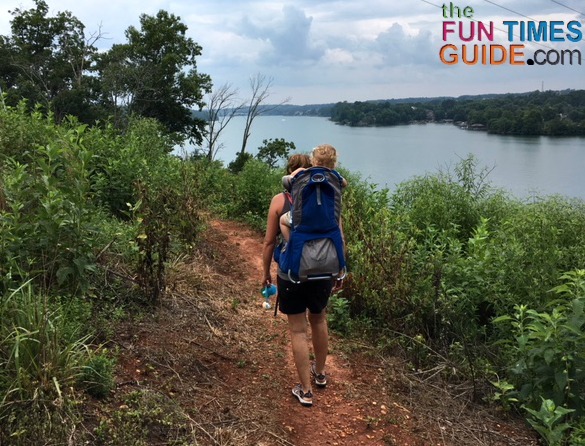 I love to get my son outside — and together my son and I hit the trail as a chance to reconnect with nature and exercise the dogs. For me, every hike or day trip requires lots of planning and careful consideration — because I’m packing my almost 30 lb. son with 2 dogs in tow! 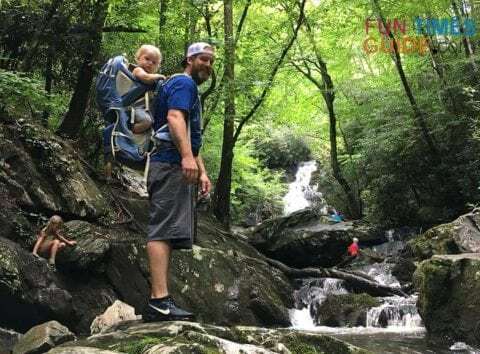 Most will agree that the cost of a hiking baby carrier is worth it — because hiking should always be fun and relatively pain free when it comes to carrying a toddler on your back! Thankfully, the technology, safety, and ergonomics of hiking carriers have changed quite dramatically over the years — for both the hiker and the precious cargo we carry. I’ve tried a number of hiking baby carriers. 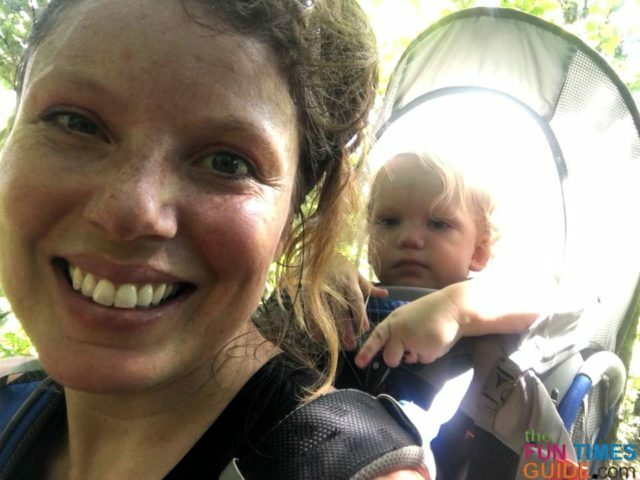 The Osprey, the Kelty, and the Deuter were the 3 baby hiking backpacks I considered when I knew it was time to upgrade from the Ergobaby 360 carrier that I had used for my son since he was a newborn. Here’s my review of the Ergobaby 360 child carrier. The Ergo didn’t provide any space between my son and I — so it was way too hot for both of us to wear my son right next to me on my back. My son couldn’t see anything directly behind my back in the Ergo. The Ergo also had no storage space — so I always had to pack another bag to carry the basics (like diapers and snacks for my son). So, I thought I’d share what I like and dislike about the 2 baby hiking backpacks that I actually tried firsthand (the Kelty and the Osprey). They are both great carriers. And thank goodness for options — because it all comes down to what is important to you and what you’re looking for in a hiking baby carrier. #1 – This lightweight aluminum frame carrier weighs in at just under 7 lbs. The maximum weight is 48.5 lbs. — which includes gear, baby, and pack. #2 – One size fits all. This is important because I’m 5’7″ and my husband is 6’2″. 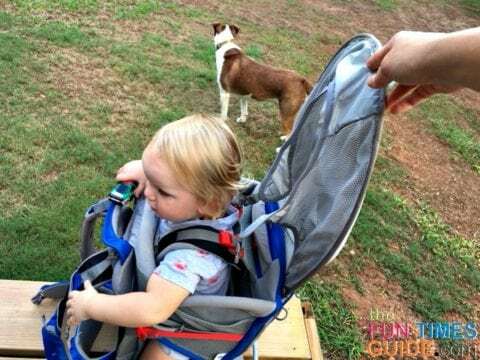 We needed a baby hiking backpack that was highly adjustable — yet would still provide the proper fit on the same hike (to provide maximum comfort for both of us). 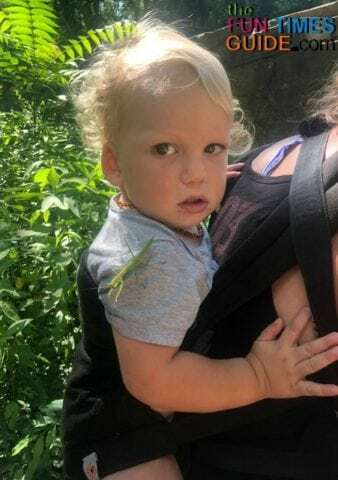 The adjustments on this hiking baby carrier are just so easy, and the center of gravity never changes — because you adjust the height of the shoulder harness not the waist belt. The waist belt always remains at the same point on the pack, keeping the center of gravity a constant. #3 – The Osprey’s anti-gravity suspension system is a contoured suspension built right into the pack. The load adjusters help displace the weight from your shoulder blades to your lumbar region and hips, while keeping your shoulder and back stress to a minimum. This suspension system also helps with load stability — keeping your precious cargo balanced at all times. #4 – The mesh shoulder harness and backpanel allow for airflow. This is a nice feature to have when you live in a hot and sticky climate like East Tennessee. #5 – The built-in sun shade on the Osprey baby carrier allows my son to see through the opening. The sun shade is integrated right into the pack, and it’s collapsible — which means it can be opened or closed quickly! It also aids in keeping tree branches out of my son’s face. I like having the sun shade attached at all times for the simple fact of not having to keep track of one more thing while hiking. Plus, the 2 clips are super easy to use whenever you’re using the shade. 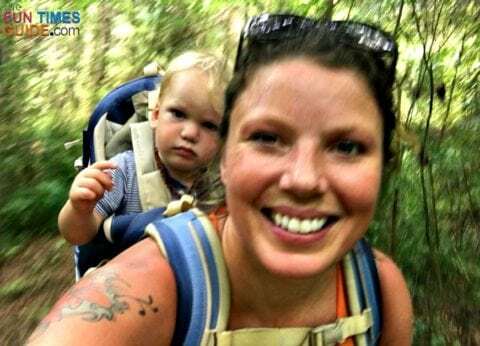 #6 – I know my son will be safe and comfortable on each and every hike because the child cockpit is fully framed — which means he will be better protected in the event of a fall (in addition to being harnessed in). The cockpit seat is completely adjustable and even has adjustable foot stirrups to aid in proper seating position for the child. #7 – I can easily set the pack down with my son still seated in it. The base on this baby hiking backpack is extra wide and super stable — because of the locking kickstand. #8 – The Osprey hiking baby carrier has 2 large grab handles for secure and easy pickups and unloads. 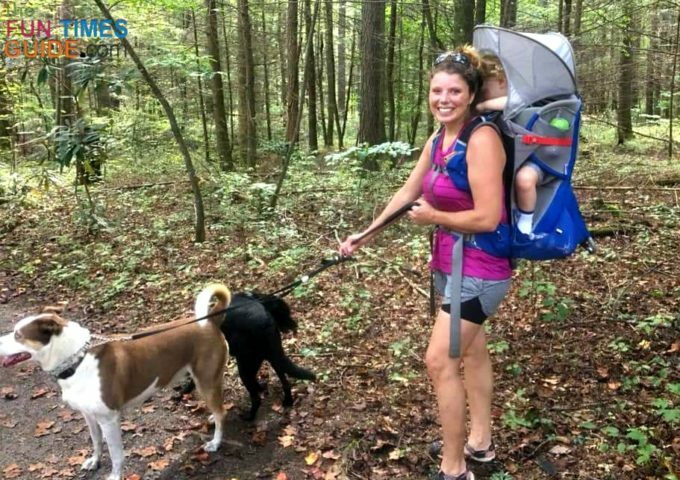 It’s always easier to have someone to help you load the hiking baby carrier onto your back, but the handles do make it manageable if you ever need to load alone. #9 – The extra large lower zippered compartment provides amazing storage space — for diapers, snacks, and other basic items. #11 – Stretch upper and lower mesh side pockets provide good storage space for easily accessible items — like snacks and drinks. #12 – There are loop attachment points in convenient places on the Osprey baby carrier — to attach toys or snack cups for my son. 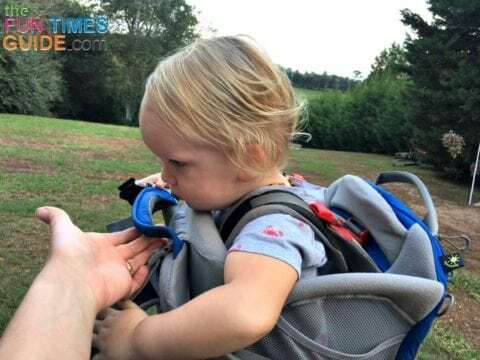 #13 – This baby hiking backpack folds somewhat flat when not in use — for easy storage. 2. The aluminum foot stand on the Osprey baby carrier is integrated in with the lower zippered compartment and is designed to manually “fold in” when not in use. So if you fill the bottom storage compartment with items, it won’t fold in all the way. You also have to remember to kick the kickstand back out if you happened to fold it in before you set the pack down. 3. 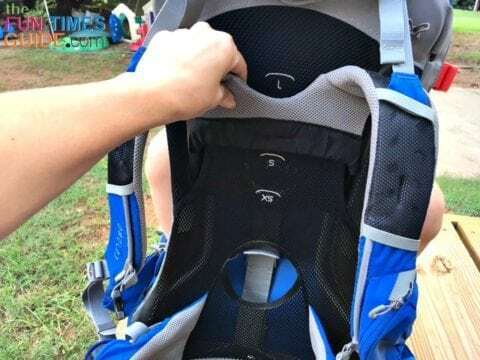 The mesh side pockets on this hiking baby carrier are super handy — but they’re truly only accessible if you’re with someone else who can reach the item for you or if you take the pack off completely. 4. I wish there was a water bottle holder on the front of the Osprey baby carrier that’s easily accessible. #1 – This lightweight aluminum frame carrier weighs in at 7.6 lbs. The maximum weight is 50 lbs. — which includes gear, baby, and pack. 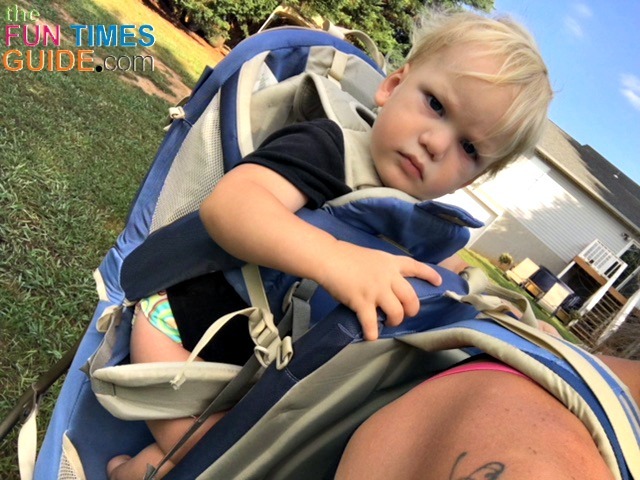 #2 – This hiking baby carrier has a really cool, padded v-frame — which is essentially a roll cage to keep my son protected from being crushed in the cockpit in the event of a fall. #3 – The kickstand opens automatically when you go to set the pack down. That’s a super nice feature! The kickstand is internally spring-loaded — so it opens when you release the pack off your shoulders and retracts via tension when you have the pack on. It also has no-pinch hinges (so no one gets their fingers pinched). 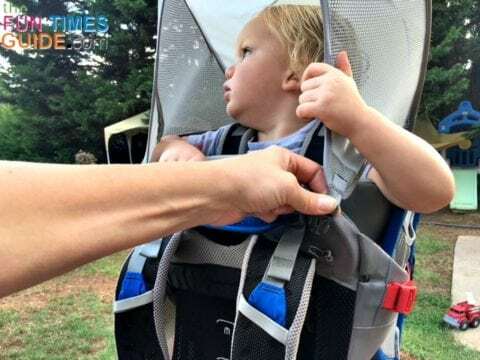 #4 – The Kelty baby carrier has a 5-point harness system that is adjustable. Similar to a car seat, the harness has a central tensioning system and is anchored directly to the frame. #5 – This baby hiking backpack is comfortable to wear because of the curved and molded foam shoulder straps. It also has load-lifter straps, and a padded hip belt to help evenly distribute your precious cargo. #6 – There is adequate fitment for tall and short hikers. The hip belt easily adjusts simply by pulling a pin located under a hidden compartment in the padded backpanel. You simply slide the waist belt up or down, according to your height. #7 – On the Kelty baby carrier, the child cockpit seat is padded. It’s also removable and washable. #8 – There is a sun shade to protect my son from the elements or random tree branches. The sun shade has mesh netting on the front and sides for good airflow. #9 – There’s a nice, large storage compartment under the seat — for diapers, snacks, and basic items. 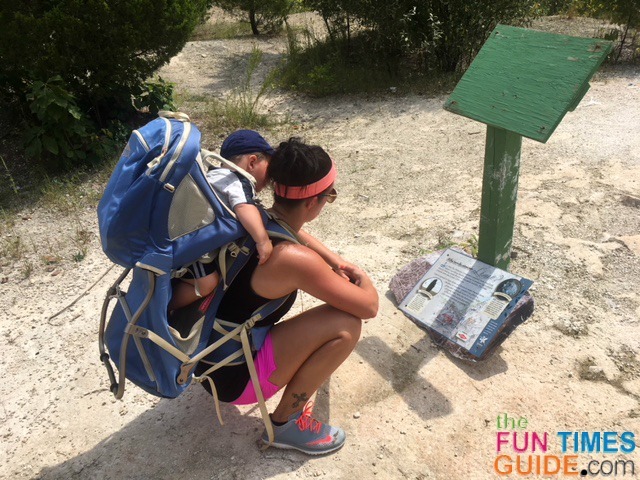 #10 – This Kelty baby carrier includes a changing pad — which is helpful for diaper changes on the trail. #11 – The carrier has a waist belt storage pocket — which is good for keys. 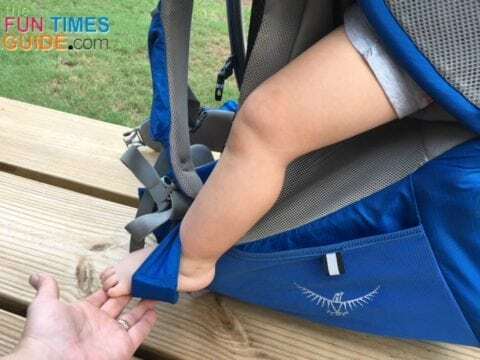 #12 – There are loop attachment points in convenient places on this baby hiking backpack — to attach toys or snack cups for my son. #13 – The Kelty baby carrier has 2 large grab handles for secure and easy pickups and unloads. 1. The sun shade requires some effort to install. You have to insert the sun shade frame into 4 points and then velcro strap to 4 additional hooks so it will stay in place. Also, the sun shade has a mesh screen on the front window and on the side openings — so my son kept poking his head out the sides trying to get a clear view. 2. There are no pockets on the shoulder straps, but a small one on the hip belt. It’s not big enough for a phone, but certainly can hold keys. 3. The height adjustments require moving the hip belt up or down — which changes the center of gravity on the pack, depending on who is using it. 4. This Kelty baby carrier does not fold flatter because of the built-in roll-cage. 5. I wish there was a water bottle holder on the front that’s easily accessible. The anti-gravity technology and the load lifters really work — getting the weight onto my hips and off of my shoulders. I really wanted the best suspension system available — because I wanted my husband to be able to use the carrier too. He has a really long torso, so I knew this would be the best baby hiking backpack for us for the long haul. The super easy to use integrated sunshade with a clear view front facing window for my son. I love how fast I can unzip the compartment, pull out the shade, and clip it into place! This sun shade is so handy to keep the sun off my son’s head because he does not like hats. The exterior upper and lower mesh pockets on the sides of the Osprey baby carrier are perfect for snack cups, drinks, toys, or anything you want really fast access to. This carrier folds near flat when not in use. I hope you’ve found some information you were looking for in your search for the best baby hiking backpack for you and your child.